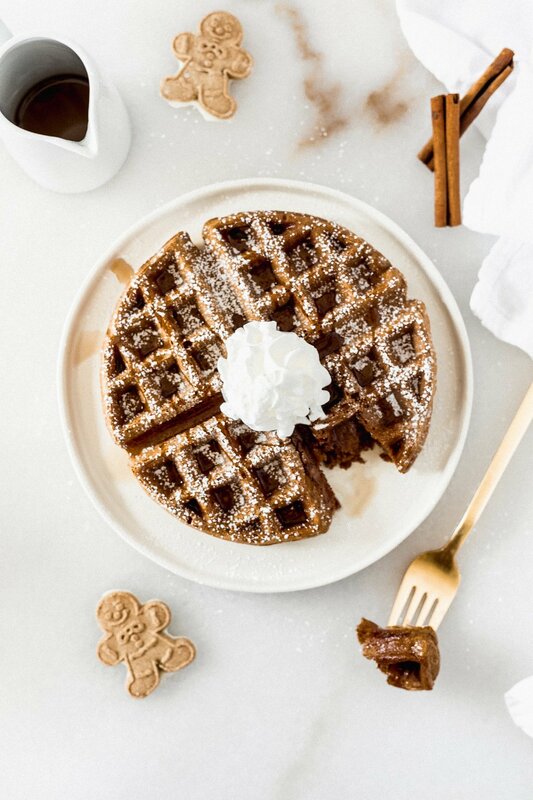 Healthy gingerbread waffles with crispy exteriors and fluffy insides are the perfect Christmas morning brunch! Have you made plans for your holiday brunch? If not, I’ve got the perfect recipe for you today! If you have, scratch them. These healthy gingerbread waffles and festive, delicious, and definite crowd pleasers! While I usually prefer savory options for brunch, like a quiche or eggs benedict, I used to be all about the sweet, syrup laden breakfasts. My mom made us pancakes, french toast, and waffles on the weekends, so holiday brunch was usually one of those. My favorite was always french toast. Family legend has it that one Christmas morning after opening gifts, we couldn’t decide on what to have for breakfast. I, of course, wanted french toast, but the rest of the family wanted pancakes. I was pretty young and was voted against, so my mom made pancakes. Apparently in an act of rebellion, I drowned my entire plate in syrup. Sure showed them. In reality, I’m sure I just couldn’t control the syrup bottle, but I got teased for it for years. The best way to resolve Christmas brunch arguments? 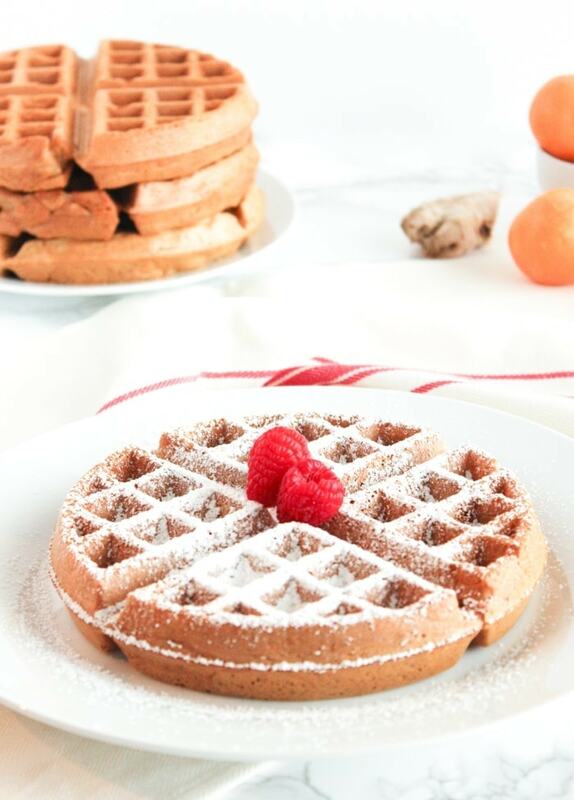 Gingerbread waffles. Gingerbread is my favorite holiday flavor, and I’m pretty sure it’s unanimously loved, so why not make it into the best Christmas brunch that everyone can agree on? 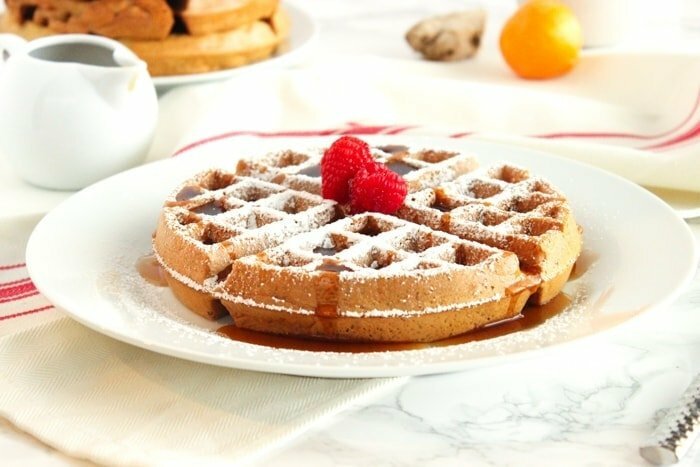 These healthy gingerbread waffles are made with whole wheat flour, fresh ginger, and club soda for an extra fluffy interior. The cornstarch helps the outside crisp up beautifully for the most perfect waffle texture. They’re irresistible with a drizzle of warm ample syrup and a sprinkle of powdered sugar. They’re so festive and fun for Christmas morning and all winter long! Do you have a family favorite holiday brunch? In a large bowl, stir together flour, cornstarch, baking soda, baking powder, salt, and cinnamon. Add remaining ingredients, starting with one cup of club soda and adding more as needed to get the right consistency. Stir until just combined. Brush hot waffle iron with coconut oil and pour batter onto surface. Cook according to manufacturer’s instructions. Remove from waffle iron when cooked and top with powdered sugar, syrup, whipped cream, or fruit. Ooooh I will definitely be trying these! They sound so delicious. 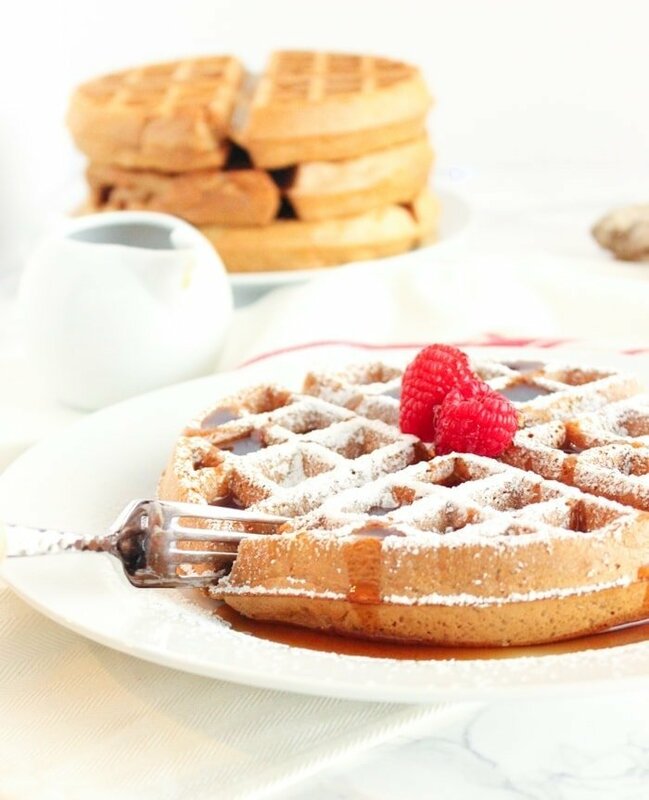 Waffles are one of my favorite breakfasts, so this is right up my alley! I don’t think these waffles could be any prettier!! Allllmost too pretty to eat!…but just almost! Wow! These look delicious! I am currently following the Ketogenic way of eating. I’m wondering if it’s possible to replace the wheat flour for either almond flour or coconut flour? Thank you so much for your great recipes! Hi Christina! I bet you could try almond four. You might need a little more liquid. Coconut flour absorbs much more liquid than other flours so I don’t think that would work here. Let me know if you try. Thanks for stopping by!